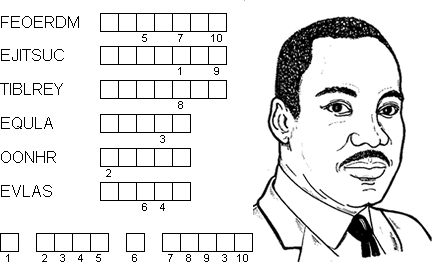 The solution is the title of Martin Luther King's most famous speech. 1. Being able to choose what you want to do. 2. To be treated fairly under to law. 3. Permission to go freely within certain limits. 4. To be the same for each member of a group. 5. To show respect for something or someone. 6. A person who is owned by another person.